Do you think your kiddo has what it takes to be, not only, one of the most renowned professors of archaeology but also the world's greatest treasure hunter? You do? Excellent! Then this fedora will rest perfectly upon his crown. 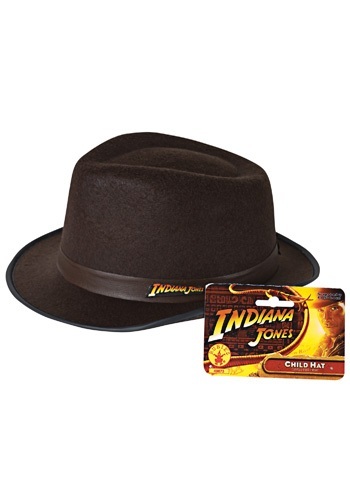 It is designed to look like the one worn by everyone's favorite non-super hero, the amazing Indiana Jones. Indy has gone on countless adventures to retrieve ancient artifacts and has accomplished these missions with flying colors, all without the help of any super powers. Having only an awesome fedora on his head, his sharp wit, and trusty whip at hand, he has found the Ark of the Covenant, recovered a stolen Sankara stone, and even discovered the Holy Grail (Right before he dropped it in the rubble of the collapsing temple... but still.). Yeah, ole Indy sure does have a nice resume as a treasure hunter. If your little one hopes to compete with him then you'd better equip him with some more classic Indiana Jones accessories. Grab him a bull whip, a satchel, and an awesome leather jacket, and your little explorer should be ready for anything while out collecting random relics from ancient civilizations.